Here in Sin City, we don’t always do things the “normal” way. We like to be a little unconventional After all, if we did, we wouldn’t be the entertainment capital of the world. Most people know that there is no better place than Las Vegas to go and party for a weekend, but what many people don’t realize is that it is also a great place to celebrate St. Patrick’s Day. And if you are looking for a slightly unconventional St. Patrick’s Day experience, then come down to Borracha for green drinks and green food that will make anyone feel lucky. While you may not automatically think of a Mexican cantina as your go-to place for St Patrick’s Day fun, but here at Borracha, we are always ready to get in the St. Patty’s Day spirit. This is why we are going to have some great food and drink specials in honor of St. Patrick’s Day. Our celebration will begin on Sunday, March 17th at 12:00 PM and last all day and into the night. At our St. Patrick’s Day Celebration we will be having $5 Jameson Shots and $5 Green Beer Drafts available all day long. Of course, since we are a Mexican Cantina, you can expect plenty of green on the menu as well, including our avocado, green salsa, and our famous green enchiladas—trust us they go great with Jameson and green beer. Of course, if you prefer to eat healthy, and get your calories from your drinks, we have our fresh garden salad. Of course, if you were to ask us what green food goes best with some green drinks, it has to be our famed Avocado fries, they go great with beer and are perfect for sharing. 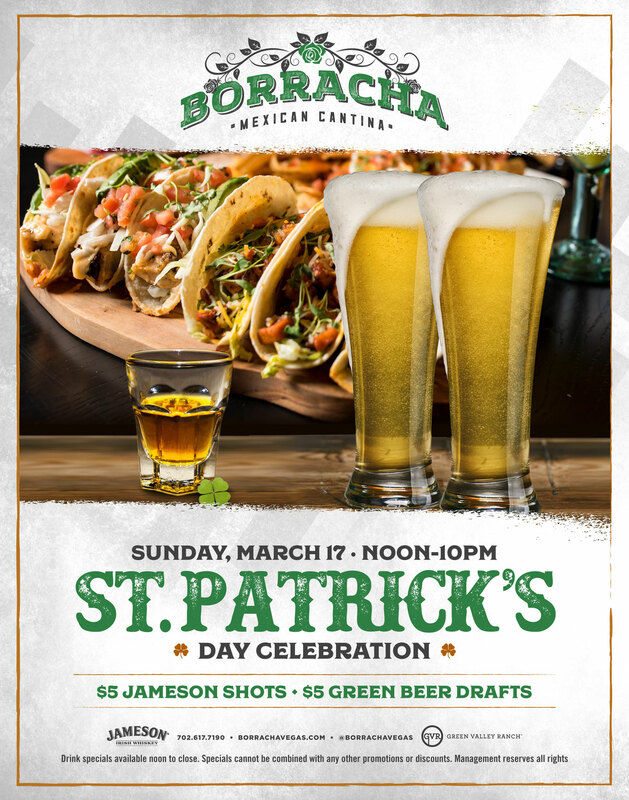 This is sure to be one of the best days of the year here at Borracha, and we couldn’t be more excited to celebrate St. Patrick’s Day, as if we were Irish. 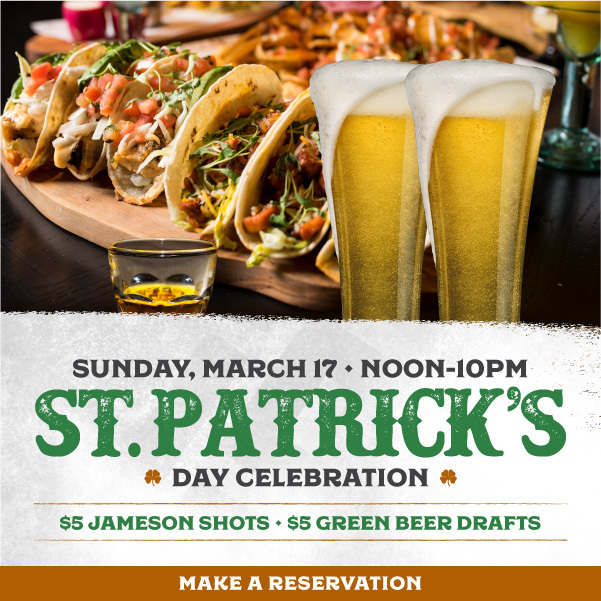 So, come down to Borracha on Sunday, March 17th, to kick off St. Patrick’s Day in style, and get a Monday hangover that you won’t soon forget. Our event and our drink specials start at noon and last until 10 PM. Just make sure to come decked in green to match our festive food and drink!